The ride to Berchtesgaden is about 30 minutes from downtown Salzburg. 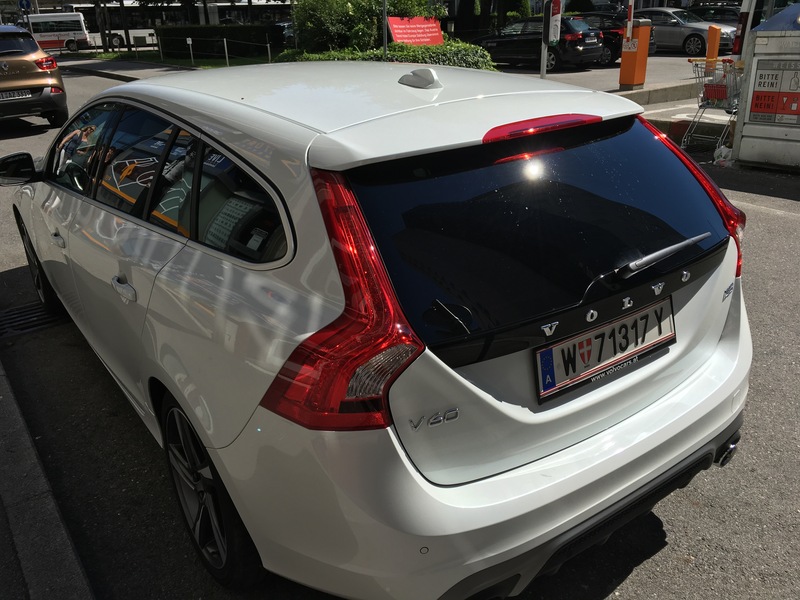 We had reserved a station wagon from Hertz and ended up with a virtually brand new Volvo. There’s a Hertz location right across from the train station, which is less than a 10-minute walk from the Sheraton Grand. The first half of the drive is on the highway without much to see. Once we got off the highway the route became more scenic. We saw a cable car very high up in the air and were intrigued. Thank goodness for Google! More on that in a future post. The salt mine is actually still in operation, though they don’t let you tour the active levels. The tour takes place on one of the upper levels of the mine. It’s still deep enough that the temperature hovers around 55 degrees Fahrenheit (12 Celsius) year-round. I really wish I could recall how much salt is produced in the region but it’s gone from my memory. A tour of the salt mine costs 16.5 Euro per adult and 9.5 Euro per child 4 years and older. You can also purchase a family pass for 39 Euro, which includes 2 adults and one child. Additional children are 5.5 Euro each. The tour takes about an hour. Tickets are available online. I strongly suggest buying them ahead of time for a couple of reasons. First, there was a pretty decent line when we got there for folks who hadn’t purchased tickets yet. Second, they reserve some tickets for online purchase only. During busier times, you’ll have access to more availability if you book online ahead of time. Once we checked in we were fitted with jumpsuits. There are lockers available for any backpacks, valuables, etc. We all got a chuckle out of how we looked in the stylish jumpsuits. There’s a bit of a safety briefing and then we lined up to wait our turn. A long train of small cars pulled into a tunnel and we were instructed to hop on board. We straddled the carts like riding a horse. Apparently, this is the same way that salt workers are transported into the mine. If there’s any part of the tour that might spook you, it’s the ride in the tunnel. There’s not a whole lot of spare room. I’m not the least bit claustrophobic, but I could see it bothering some folks. The ride is only about 5 minutes but there’s not a heck of a lot of light. The tour itself is about an hour. It’s conducted at a leisurely pace with a few places to sit. The process of mining for salt involves flushing fresh water into the mines to create brine, which is pumped out and reduced to “white gold”. We got to explore tunnels that had been previously mined and took a short boat ride across a brine pool. On the other side of the pool we got to taste the brine. As a self-avowed salt addict it was still very salty. The highlight of the tour? The slide. Yes, there’s an old slide the workers used to use. Or, maybe it’s just there for our enjoyment? As simple as it sounds, it was a ton of fun. For those fearing being trapped underground, the ceiling height really isn’t too bad even at the shortest spots. There are a couple of bathrooms along the way as well. For all intents and purposes, we didn’t feel “trapped” at all during our tour. Kudos to my awesome wife, Michelle. She’s the one that suggested the Salt Mine tour. It sounded novel to me, but definitely exceeded my expectations. It’s a fun way to spend a couple of hours if you’re looking to get out of downtown Salzburg and explore a bit. The experience is absolutely geared towards families with children, though there were plenty of folks without kids on our tour. The Salt Mine is something I probably wouldn’t have missed if I’d never heard of it. But, our trip was better for having the experience. Great story and pictures. Added that to my to do list. I did this with my family when I was a child (late 1960s), and my parents had done it in the ’50s back when they only had one child. The outfits they put us in were VERY different than the ones you and your family were wearing; they looked like what the Seven Dwarves from the animated Disney movie had on. It was a fun thing to do back then, and I’m looking forward to doing it again on an upcoming trip to Salzburg. Glad your family had such a good time; Salzburg is a wonderful city.